She goes on to say that she is as ignorant of cooking as of “Gaming, Dancing, and Revelling,” apparently suggesting that the culinary arts constitute a frivolous activity for aristocratic ladies. I am always suspicious of Margaret when she seems to admit to ignorance, as in her repeated claim to not be able to speak French. Certainly, she has detailed knowledge of what went on in her kitchens, and she draws on it for the comedy The Matrimonial Trouble (1662). The steward Thrifty chides Bridget Greasy, a kitchen maid, in the following lines. It appears that poor Bridget is berated for wasting grease as well as for being uneconomical with hot water. In the process of his small lecture, the steward Thrifty a employs a vivid metaphor in the verb “lick.” I certainly hope he does not expect her to actually lick the cutting boards, dishes, and such clean before she washes them in hot water. Bridget’s appearance takes us back to blog post 11, in which a version of greasy Joan from Love’s Labours Lost makes an appearance. Hannah Woolley does not adhere to the comic stereotype that is found in Cavendish’s depiction of Bridget Greasy. Woolley, in a book that includes advice for women servants in great houses, tells kitchen staff to attend to personal hygiene and wear clean clothing — which staff are to launder themselves. For scullery maids like Bridget, she holds out hope for modest social advancement. “You must wash and scowr all the plates and dishes that are used in the kitchin, likewise the dressers and cupboards, also all kettles, pots, pans, chamberpots, with all other iron, brass, tin, and pewter materials, that belong to the Chambers and Kitchin. “You must wash your own Linen, keeping your self sweet and clean, remembring always, so soon as you have made an end of your dirty work, to wash and dress your self neatly, titely and cleanly. In Sociable Letters, a kitchen maid (discussed in blog post 11) ascends socially to become the lady of the house. However, Margaret is describing, again comically, an unusual turn of events much like what happened when a laundress named Nan Clarges married the famed Civil War general George Monck. Nan, so elevated, went on to become the Duchess of Albemarle. Hannah Woolley no doubt expects that the kitchen maid she describes would only advance within the ranks of servants. Margaret includes a set of poems on how Nature orders human life in Poems and Fancies (1653). In “The Dissert,” for instance, the kisses of a newly establish couple are like marmalade and youth is like marzipan. Marchpane of Youth, and Childish Macaroon. And wafer Promises, which wast into Chips. I especially like the preserved children who have no father. I expect that these children are foundlings of the orchard, cherries and peaches which cannot be connected to any particular tree or grove. There is, of course, a suggestion of actual illegitimate children. Margaret’s oldest brother was one of these, but completely accepted by the family. As Margaret’s poem may suggest, aristocratic ladies, and not just kitchen staff, took an active interest in preserving summer fruits. With the advent of cheap and readily available sugar, it made sense to keep ones’s abundance of berries and peaches from simply rotting away. At the same time, such wealth of fruit offered an opportunity to try out or create new recipes, as is implied in the title of Hannah Woolley’s The Ladies Directory in choice Experiments and Curiosities (1662). The word “experiment” is still used today, often as a joke by amateur cooks to describe new culinary creations. The joke derives from the fact that what is created in modern kitchens is not normally what we think of scientific experiment. In Cavedish’s and Woolley’s day, however, an “experiment” in the kitchen might be simply a testing out of a new recipe. 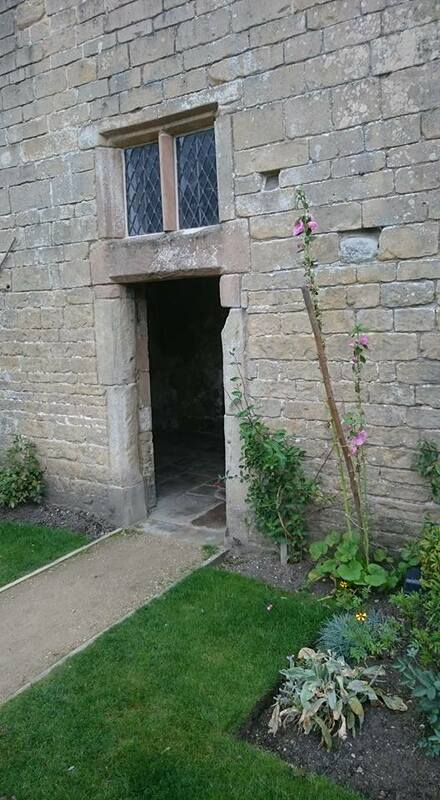 That said, herbs were often used medicinally and simples grown in gardens were compounded together, according to John Evelyn, in “laboratories” also found in gardens. 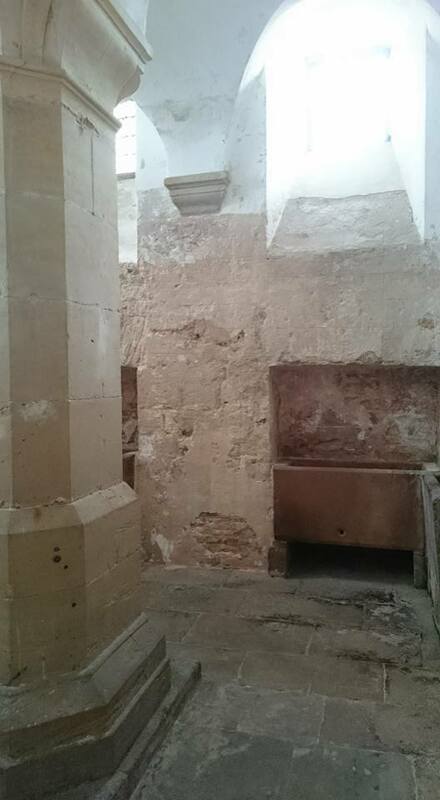 William Cavendish, Margaret’s husband, apparently had some sort of laboratory in one of the niches in the garden wall at Bolsover Castle, though it was probably more oriented towards what we would call “hard science” than kitchen remedies. Evelyn, by the way, was perhaps a bit ahead of his time in suggesting, as he does, that kitchens should be kept well away from the main house. The following poem printed by Hannah Woolley as a preface to The Queen-like Closet (1670) extends the connection between cooking and medicine to include virtuoso science. A closet was a small room in which amateur scientists (virtuosos) kept oddities and curiosities — often a mish-mash of objects with genuine scientific importance and conversation pieces. 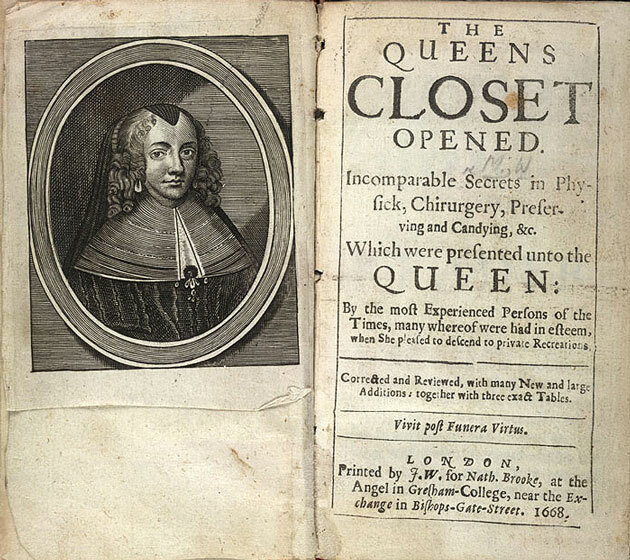 Woolley’s title clearly attempts a connection to the highly successful Queen’s Closet Opened (1655), which purported to contain recipes from the dowager queen Henrietta Maria. Woolley knew how to situate her books for maximum sales, which is by no means to diminish these books themselves in any way. Jems richer than in carcanet. These keep your Bodies in good ease. They please the Taste, also the Eye. Since ’bout them I my Brains do beat. If that I come within your way. So I may have to serve my need. Margaret Cavendish also says that she “beats her brains,” which she does while engaged in writing and, I would guess, revision. In the company of the Dutch virtuoso scientist Constantijn Huygens, she conducted what may have been actual chemical experiments, and she was a woman who liked to create medicinal juleps. Still, Margaret was not a committed experimenter and preferred her science to derive from something like what Einstein called “thought experiments.” That is, work in the laboratory of the mind. I will confess that I am not quite sure how much time she spent cooking or supervising cooking, since her cooking references are so often either metaphorical or part of comic narratives. I will conclude this blog post with a consideration of two farcical fight scenes that involve food. In Letter 32 of Sociable Letters, a couple gives a dinner party but countermands each other’s orders to the cook. The husband asks the cook to deliver a “solid” English roast beef, but when it arrives the the wife cannot not abide its presence on the table because of its odor. In a bid to elevate herself socially, she demands that the beef be replaced with a fancy French “quelquechose.” Margaret tells us that the wife did not want to appear as a “country -Lady” but as a “courtier.” The narrator finds the ensuing battle, in which dishes are thrown back and forth, enormously amusing, and the story makes one wonder if this sort of thing happened very often in actual life. The second fight is one that is recommended (or perhaps imagined) by Robert May in The Accomplisht Cook (1660). As prefatory matter for the book, he describes how a pastry sailing ship, a man of war, can be made. May goes on to suggest (perhaps as part of a male fantasy) that the ladies present should pelt one another with with the egg shells. I wonder if this kind of hilarity ever transpired or if it was thought up by May and printed in his preface to secure purchases from people browsing in booksellers’ stalls. The publication date of the volume does mark the beginning of the Restoration and the reign of the “merry monarch,” Charles II, so May, like Woolley, appears to have known how to fit in with current trends. By the way — the “Kickses” mentioned in the building of the pastry ship are probably “kickshaws,” which in turn derive their name from the word “quelquechose” — mentioned by Margaret in Sociable Letters. It does look like she knew a bit of French. Perry, mentioned in Woolley’s poem, was pear cider.